Fragrance refills are designed for use with Rubbermaid Microburst Duet Dispensers and feature a unique combination of specially selected, exclusive aromas of perfume-quality fragrances. This Alpine Spring/Mountain Peaks refill delivers a rich fragrance combining florals, precious woods, amber and musk. High-quality fragrance oils are dispensed through Microburst technology for longer-lasting performance. One highly concentrated refill set for the dual-fragrance Microburst Duet Dispenser (sold separately) replaces three standard refills and lasts up to 180 days between refill changes, significantly lowering labor and odor management costs. 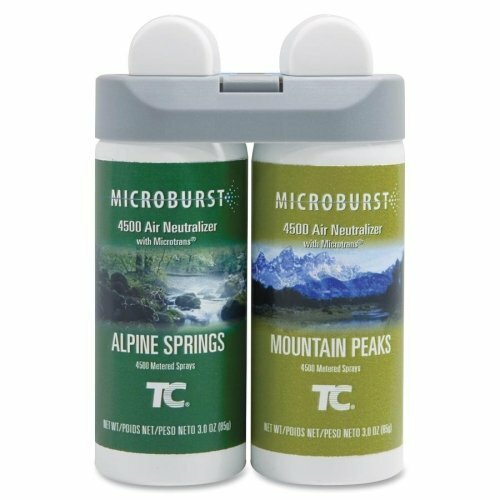 These refills and all other refills for the Microburst Duet Dispenser (sold separately) contain MicroTrans odor neutralizer. If you have any questions about this product by RCP, Inc., contact us by completing and submitting the form below. If you are looking for a specif part number, please include it with your message.